The Roman Arena was a place of entertainment for Romans. The games were often brutal and bloody. At first they were mostly put on for memorials or funerals, but later they were put on for many occasions including birthdays and victories. The games were paid for by wealthy individuals and were used for that person to gain popularity with the people. Julius Caesar became very popular by putting on large public games and theatre. Sometimes the games would last all day. At the start of the day they would use exotic wild animals such as bears, lions, rhinos and elephants. Sometimes the animals would fight each other, sometimes the animals would be hunted by huntsmen, and sometimes criminals would be thrown into the arena to be killed by wild animals. The main attraction in the arena was the gladiators. Gladiators were men who would fight each other in the arena. Usually gladiators were slaves or prisoners, but sometimes volunteers would become gladiators. A very few of the best gladiators who survived would become rich and famous. The gladiators were trained to fight. They had different areas of specialties in terms of fighting styles and weapons so each fight would be different and interesting for the people to watch. Some gladiators used heavy armor and swords, while others fought with little armor in order to be quicker. One type of fighter called a retiarius would use a net and a trident to fight. Each style had its advantages and disadvantages. Not all of the fights were to the death. When a gladiator was about to lose he could ask for mercy. The crowd or leaders would then decide if the loser would live or die. Another favorite pastime of the Ancient Romans was the chariot races. This is perhaps the oldest of the Roman pastimes. There were teams that raced: the Reds, Greens, Blues, and Whites. People would follow and cheer their favorite teams and riders. Top chariot racers were heroes just like the top athletes of our day. The races were held in an arena called a circus. The oldest and largest circus was the Circus Maximus in the city of Rome which could seat around 150,000 people. The Ancient Romans also enjoyed theatre. Much of their theatre was copied from the Greeks. Like the games, wealthy people would put on theatre for free in order to gain popularity. Most of the actors were Greek and their favorite plays were comedies. Two of the more famous play writers were Livius Andronicus and Gnaeus Naevius. The Emperor Commodus often fought in the arena. He fought gladiators as well as wild animals. The Romans invented the mime. This is where acting was performed with only body movement rather than speaking. Chariot racing was very dangerous. There were wild crashes and often a rider was badly hurt or killed. 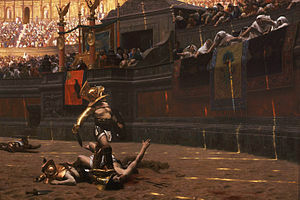 Sometimes gladiator fights were stopped to allow the fighters to get a drink and a rest. A gladiator slave named Spartacus led a slave revolt in 73 BC.